"TWO BUCKS DOWN IN 15 HOURS!" I live in Missouri. 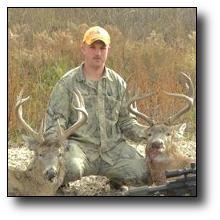 Deer archery season opens on September 15 and closes on Nov 13 for the 11 day rifle season, and then opens back up until the 15th of January. My wife Julie, hunting partner Bob and I have been traveling the 6 hours to our hunting spot for the past two and a half months. We have a fifth wheel camper, so we have been taking 3 day weekends as often as possible, two or three times a month. I'm in the military, so I have drill once a month and am getting ready to start a yearlong deployment on the 4th of December, so we've been hunting pretty hard. I was fortunate to shoot a doe with my bow on the 31st of Oct at 30 yards out of my Double Bull blind. We saw a really nice 10 point buck on our first trip with my buddy's Swarovski spotting scope at about 400 yards, but haven't seen him since. There was a lot of crops in the fields, so hunting was pretty hard. So I decided I was going to start my two week hunting trip by myself on the 9th of November. I had drill that weekend before and had to go to Ft. Sill, Oklahoma to get my deployment gear issued. So I got up north, picked the camper up and headed to our hunting spot. I got the camper set up and had a little time to hunt that afternoon. I didn't see much that afternoon, a couple of does and a small forked horn buck. Now it's Friday the 13th, my last day I will probably be able to bow hunt until late next season. There is still a lot of corn in the fields so I decide I would haul one of my hunting partners tree lounge into a patch of woods that he gun hunts. So I packed my bow, backpack and stand into the woods, maybe 3/4 of a mile. I got in the stand at 2 P.M. or so. I had seen a really nice 8 point buck but he was at 50 yards and I don't feel comfortable shooting at that distance. He was chasing a doe. I videotaped it. I also saw a small four pointer walking one of the many deer trails. At about 515 P.M. or so, I hear some noise coming from behind. As I turn and look and see a buck coming down the same trail as the small four pointer. I could see he was a shooter buck to me. I've only been bow hunting for 4 years and it was my last day to bow hunt for a year. I was losing light fast. He got to within 20 yards or so and then he spotted me. I didn't have my bow drawn yet, so I had to wait for him to look away. He finally looked away and I got my bow to full draw, but he was looking right at me so I didn't have a shot. At 535 P.M., I finally was able to get the shot off. I wasn't sure how well the placement was. I saw I didn't get a pass through, so I grunted at him while he was running away and he stopped for a second or two, and then took off. I had an idea where he went, so I sat back down in the tree stand and tried to calm down. I called Bob and Julie on the radio and told them I thought I had a pretty decent buck down. They asked if I needed help, and I told them yes I did. I wasn't finding much blood. So we waited about an hour and started to track some blood. We weren't finding much blood at all. Then two more of our hunting partners called and asked with we needed their help? I told them that if they wanted too, we could use it. They showed up at about 8 P.M. We looked for about an hour after that. We would find small spots of blood every 10 yards or so, so we all decided to back out and we would look tomorrow after the morning of the opening day of the gun season. Saturday the 14th of November... (opening morning of the gun season) . I'm setting in my Double Bull blind and I'm hearing shots all around me. But I haven't seen anything. Then at around 8 A.M., I hear 6 or 7 shots come from another property to the west and I see a nice buck running on our property through a cut bean field heading for some standing corn. Then I see a doe and another nice buck, they are 600 yards away. The second buck stops in the cut bean field so I think I'm going to try and head him off before he gets to the standing corn. So I get out of my blind, grab my rifle and take off running. Let's just say that the buck was faster than me! So now I'm probably 400 yards from my blind and stop and try to catch my breath. Then I start walking back to my blind when I look to the east and I see a buck at about 300 yards. I stop and drop to the ground. I'm in a cut corn field, but I'm too low, so I get back up and start walking slowly towards him. I get to the crest of the field and kneel down. I can now see he is a shooter. The buck is still walking towards me, I can't believe it! I would say he got within 75 yards of me when I send a shot his way. He didn't go down. I gave him another round in the chest. My first shot was on the money, a heart shot. I walked up to him and "wow", I count 13 points and his G1's come within 3 inches of touching each other. It was 830 A.M. I have one buck down and I need to go look for the second one from last night. I called Julie and told her. She said she would come and help track the deer. Bob heard the radio talk and came. We started looking and not finding any blood, in addition to what we found last night. Then, after about 25 minutes, Bob found some blood. We tracked him for about 40 more minutes, we found blood spots every 10 yards or so. Then all the sudden there he was in the bottom of a creek bed! "WOW," what a buck! He is a 9 pointer with good mass. What 14 hours of great hunting! 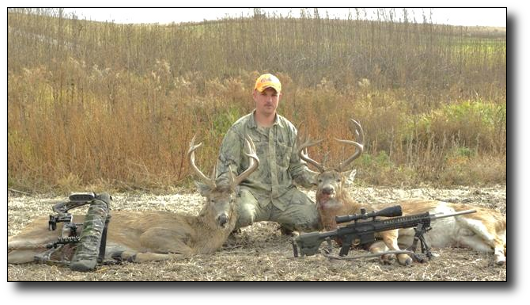 I had shot the two biggest bucks of my life time. One with my bow, and one with my rifle. I would like to thank my wife Julie and my hunting buddies Bob, Barth and Roger for all their help! Bow: Mathews Switchback XL, Spott Hog 7 deadly pins, Octane stabilizer, Carbon Express arrows and Rocky Mountain Sniper broad heads. Rifle: AR-10 .308 with a Harris bipod and a Springfield Armory 4-14-56 scope.